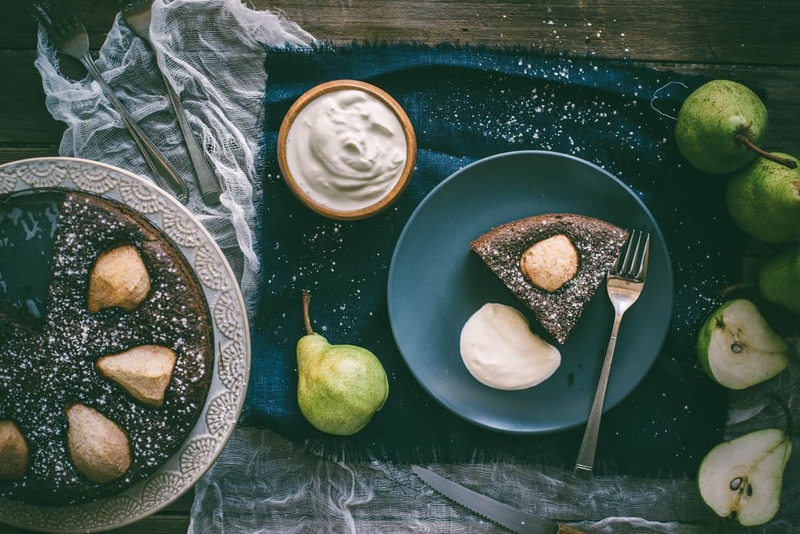 This chocolate and pear cake recipe combines the best of in season pears and dark chocolate. A truly magical combination. Hello Winter! You’ve certainly taken your time in making an appearance this year! And like all late arrivals, what an entrance. You hit us hard and all at once. In the last week or so I’ve been busy experimenting and warming up my tiny kitchen and apartment with a selection of delicious sweets and slow cooked braises. Which brings me to this chocolate and pear cake recipe. What a combination. Dark chocolate and in season pears. And you’re probably thinking, “not another chocolate cake!”. I think its good to experiment and I can definitely add this to my long list along with my chocolate and beetroot cake and my paleo chocolate cake. The cake is naturally gluten free using almond meal as the flour of choice. There’s also some good quality butter, dark chocolate, sugar and eggs. I’ve spiced it up with some vanilla and I also think cinnamon would work beautifully too. In fact, this cake is quite versatile you can add any fruit on top. I did version of this the other day with frozen raspberries and a good splash of Chambord added to the batter. Just a note regarding the pears if you plan on making this. I used Packham pears that were definitely on the “crunchier” side. Whilst they did soften up in the oven I think a good idea would be to blanch them for five minutes before adding them to the cake. Or just use softer, riper pears. And don’t be put off by the amount of dishes used to make this. It’s totally worth it. Serve this up with some deliciously sinful double cream, creme fraiche or even Greek yoghurt. Scroll down for the chocolate and pear cake recipe. A gorgeous chocolate using in season pears and dark chocolate. Keep this one bookmarked! Adapted from here. Preheat your oven to 160 deg C using the fan force option. Grease and line a 20cm spring form baking tin and set aside. Using the double boiler method melt the chocolate and butter until we'll incorporated. Add the vanilla, stir and set aside. In a spare bowl combine the egg yolks and sugar and whisk until thick, pale and creamy. Set aside. In another bowl beat the egg whites until stiff and set aside. To make the cake batter add the creamed sugar mixture, almond meal and sea salt to the melted chocolate combination and stir until combined. Finally, fold through the egg whites very gently making sure they are well incorporated. Pour the batter in to the baking tin and cook for 5 mins. Remove the cake and arrange the pears cut side down and bake for a further 40-45 mins or until a skewer inserted comes out clean. Allow to cool for 10 mins before removing the cake and allowing to cool completely. Dust with icing sugar and serve with double cream, crime fraiche or yoghurt.